Never heard of this Dr. Shock. Cannibal Holocaust was indeed disturbing to say the least. I am going to search out this one. If this is even half as sick as Cannibal Holocast then it will be good. I want this. Used your Amazon link but Amazon is selling this as USED, what's up with that. I want a fresh, new, unsoiled copy. Do you know of another place selling this? 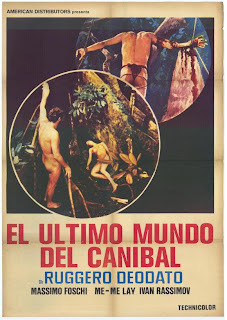 This is a movie that I myself just recently learned of, and if you liked CANNIBAL HOLOCAUST, then it's definitely one you should check out. Jermaine: Thanks for stopping by, and for the comment. Perjaps the best deal is at oldies.com. They have the Jungle Horrors 3-pack (including this film, EATEN ALIVE, which I haven't seen, and MASSACRE IN DINOSAUR VALLEY which I also reviewed on this site) for only $16.95 plus shipping! Here, you get 3 movies for the price of one. Now, MASSACRE IN DINOSAUR VALLEY was no classic; it had a weak story that wasn't exact;y executed well, but I will say it certainly wasn't boring. Thanks again for stopping by, and please let me know what you think of the film when you finally get a chance to see it. Love this flick (though completely agree about the horrible tacked on animal violence). I find it feels grand and epic in scope, especially in the cave. Just stands out in terms of visuals! @Richard: Thanks for the comment, and my apologies for not responding sooner. Animal cruelty aside (if you can even PUT it aside), the story is well-told, and the movie packs a real wallop. definitely worth a watch!